Baskets of Scraps and Is it Summer or Spring here in South Texas! Here I am a week later thinking I would be caught up on all of my applique. I have made some progress, but not as much as I wanted to. I have completed 9 of the basket blocks (with appliqued handles) and 11 more to go. As I placed the baskets on the design wall, I noticed that there is a space that really tends to stand out and I will have to figure out what to add that will make it look better. It is almost a diamond, but then the top of the block below the first row stops that. I am leaning toward adding stems and leaves in all of the baskets and especially something that will lap over into these spaces. The baskets are not situation where they will end up in the quilt as they are randomly placed on the design wall as I finish each one. 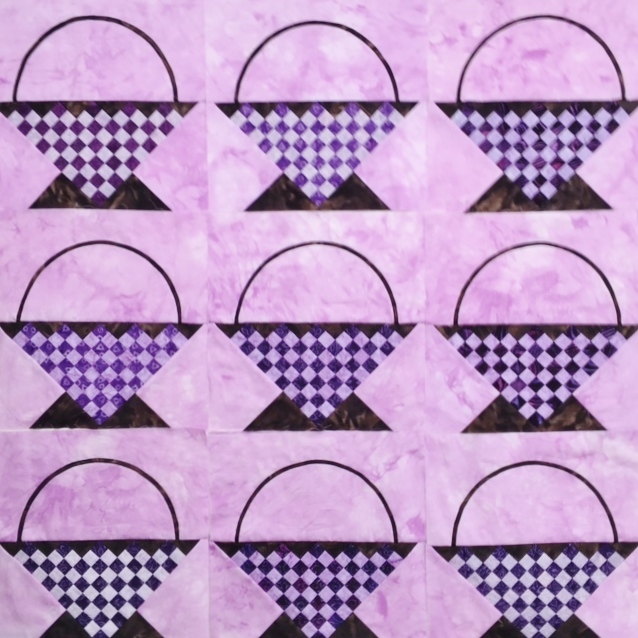 I have selected a beautiful dark purple batik that was originally purchased for another quilt, but it will add so much to this quilt. When the blocks are complete they will be put away for a week and I will come back to the quilt to make a design decision on what to do with the basket background. Monday and Tuesday are definitely off the calendar for quilting – we must make sure the doctors stay in business – so Wednesday is my drop dead day to start preparing my Civil War Blocks. I will have about 6 days to prepare 5 blocks. I am going to go with batiks! As I look at my reproduction fabrics versus the batiks I will have so much more of a choice in vibrant colors for the leaves, flowers, birds and even the CWB Bride. I will be changing some of the blocks as I prefer that the birds and animals are not as crudely drawn as the original. So this will be a great learning experience. I will be using The Lost Boy quilt pattern for the majority of the quilt, Bountiful Life, and Patricia Cox’s pattern for some of the animals or blocks. Patricia draws some wonderful birds and leaves. This will be a fun project as 4 other ladies will be joining in with me. We are planning to start on 1 March and will do 2 blocks per month so we will be through by March of 2017. This will certainly take some dedication to the project. We will start with Row A Blocks 1-5 (going down). I am hoping to have all 5 blocks prepared and ready to go by the 1st. BUT, you all know how life goes, I will be happy to have 2 block ready! Have a great Sunday and keep on stitching! This entry was posted in Uncategorized and tagged Bountiful Life, Civil War Bride, Folk Art in New York, The Lost Boy Quilt. Bookmark the permalink. Thank you for your compliment. I am changed the design of the quilt. I do not want to put anymore time into it. Hopefully it will be finished today! YEA. We are now in the 70-80 degree days and high 40’s-50’s at night. Maybe we will be lucky and have a cooler summer. 105 degrees with high humidity is getting old. Today is cloudy and short weather again.